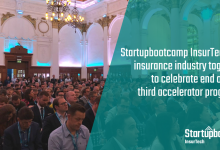 11 InsurTech startups are about to embark on an intense three-month journey of growth and development as they take part in Startupbootcamp’s third London InsurTech acceleration program. The teams have arrived ready and raring to go, having gone through a meticulous and rigorous scouting and application process. 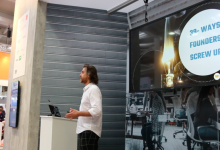 They represent some of the most talented InsurTech startups from around the globe, and each of them has a fantastic opportunity to scale-up their businesses at a rate they will not have experienced before. It will be an exhausting period for the teams, but one which they will thoroughly enjoy and use as a platform to propel themselves to achieve great things. 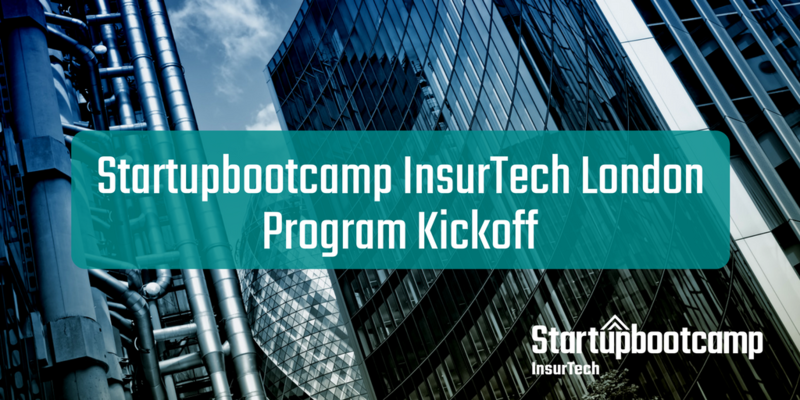 The startups have relocated to Rocketspace, London, the co-working space where Startupbootcamp InsurTech is based, for the duration of the three-month program. The teams will attend regular workshops and masterclasses focused on business scaling in areas such as lean methodology, customer acquisition, financial modeling and commercialization. In addition, the teams will be able to take advantage of Startupbootcamp’s impressive range of corporate partners and mentors. 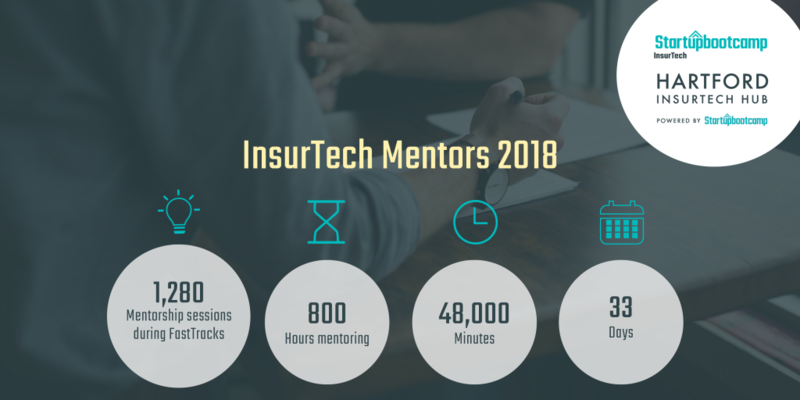 The partnership opportunities and connections that the teams will make with several of the leading corporates in the insurance industry, and the mentorship they will receive from over 200 industry-expert mentors, will prove invaluable. 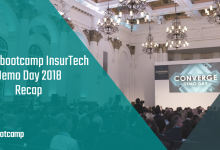 SBC InsurTech London partners include: The Admiral Group, Allianz, Confused.com, ERGO, HDI, Intesa Sanpaolo, Lloyds Banking Group, L’olivier, LV=, Metropolitan, MJ Hudson, MMI Holdings’ Exponential Ventures, Momentum, Munich Re, Old Mutual, PwC, Route66 Ventures, Scottish Widows, Swiss Re, Talanx, Tryg, UnipolSai, XL Catlin, and Zurich. Each startups will have the chance to showcase their ventures and share their experiences with hundreds of investors, mentors and partners at Demo Day, our program-ending event on May 17th. Applications for the third Startupbootcamp InsurTech London program opened in July, but our scouting process started months before. 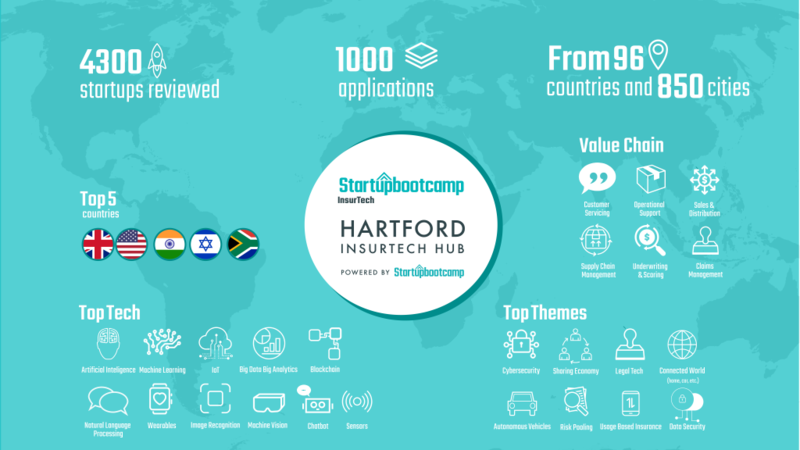 Overall, along with Hartford InsurTech Hub, 4,300 startups were reviewed, and 850 cities around the world were scouted in order to find the top InsurTech startups, showcasing the program’s truly global reach. In total, we conducted 1,280 mentor sessions during FastTrack events, resulting in 800 hours of mentoring! Our team’s scouting effort was mammoth, but all the hard work has certainly paid off as we welcome a fantastic and hugely talented group of InsurTech startups from around the world, to London. Insurance, an industry often seen as old fashioned, is starting to wake up to the era of digitization. 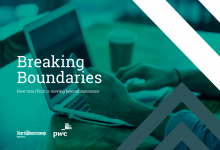 InsurTech, originally seen as a highly disruptive influence in the insurance sector, is becoming increasingly recognized as a great opportunity rather than a threat. Startups are the principal drivers behind InsurTech, and incumbent insurers are seeing great value in forming strategic partnerships with them as they strive to provide a more efficient, personalized and customer-friendly service to consumers. The 11 startups in our 2018 cohort represent a diverse range of countries that span across multiple continents. There are two startups from Sweden, two from Israel, and one each from India, Denmark, Croatia, Germany, Finland, UK, and the US. 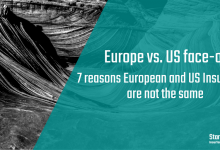 The US and UK have been the most prominent players in the InsurTech space for a number of years, but the fact that our 2018 cohort is made up of such a varied range of countries, shows that InsurTech innovation is spreading and making an impact globally. CyStellar, from Sweden, is an AgTech cloud-based decision platform that integrates geo-referenced information from a variety of sources including satellite imagery, drone-based surveillance, weather forecasts, ground-based sensors, and other social, societal, political, and economic information in order to provide actionable intelligence to farmers – large and small – at a reasonable cost. Deemly, from Denmark, is a reputation and social verification tool for P2P marketplaces and sharing economy businesses helping them build trust for their community, ultimately allowing users to take their reputation with them across all their online activity. Derma 4.0, from Germany, offers AI-powered skin cancer screening solutions. Flowenum, from Finland, is a predictive AI solution for insurance companies. Their B2B offering is an end to end solution that enables insurance companies to build connected, individualized, smart insurance services and products for customers in the digital age. ForestCar, from the UK, is a car sharing service for airports. The business offers car owners free airport parking in exchange for renting out their vehicles while they’re away on a trip. ForestCar’s mission is to create a global community of travelers who want to explore the world and contribute to a sustainable future and as such donates a share of their revenues to reforestation. PicUp, from Israel, is a system that optimizes Business to Consumer phone call performance. The system improves agents call success rates in the service and claims department and also enables sales agents to gain phone responses from those clients they need to access the most. Polywizz, from Israel, analyzes a client’s entire insurance portfolio through deep learning, then cross-analyzes it with the information the carrier has on the customer to determine when a customer is over/under insured, giving the insurance agent/broker a better tool to cross-sell to existing customers. 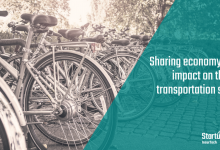 vDexi, from Sweden, in co-operation with the worlds vehicle manufacturers is collecting data from connected cars and delivers data parameters to service providers in a variety of market verticals. The platform fetches data from the Connected Car and delivers it to the Service Provider in a standardized format, regardless of Car Manufacturer and Car Model. vHealth Lab, from Croatia, is a smart telemedicine platform supporting a multitude of portable, FDA-approved ECG devices that is empowered by machine learning technology. ZASTI, from India, provides a scientific and proven way of predicting component or mechanical failure within commercial and industrial environments using a transparent SaaS model. ZASTI’s Deep Learning algorithm, trained and tuned for prediction, allows analysis of wide array of data from multiple sources (sensors, legacy systems, maintenance records). Zeguro, from the United States, offers a customer- and data-centric cyber insurance platform that helps small to medium enterprises mitigate the risk of loss. It provides insights into ways to manage digital risks, while allowing businesses to get the right insurance coverage. It also connects customers with service providers for quick claim service management.